You might think that the days of remote-controlled boxing robots, like the ones in Real Steel, can only be part of a far-flung future. 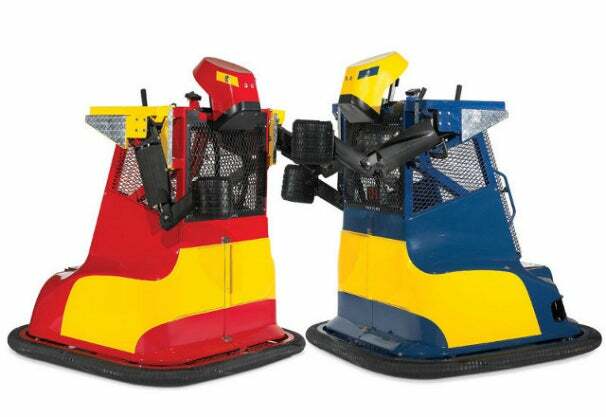 But it just so happens that future is happening right now with these life-size “Rock ‘Em Sock ‘Em robots” that you can jump into and duke it out. Hammacher Schlemmer, a New York-based hardware store that dates back to the Civil War era, is selling these Bionic Bopper Cars as a pair of two to recreate the classic children’s game. One major difference is that, instead of handheld robots, you’ll actually climb into the steel cage cockpit to throw uppercuts with two massive tire-tread-fisted arms. These hefty robots weigh in at 850 pounds, are 6 feet tall, and are built with a steel frame wrapped in fiberglass and aluminum body panels. The robots are also equipped with a Honda engine that lets them move like a 3 mph tank: forward, backward, and left and right spins. Between the gas engine and the 12-volt battery powering its electronics, the robots are rated to last for five-hour bouts of heavy metal action. Now to bring this whole robo-boxing fantasy back to Earth, these robots run a $17,000 price tag, so you better start saving up.